We hosted a Development Meeting for the International Promotion of Literature & Books on Wednesday 25 January from 12-2pm at Saltire Society, which was a very well attended, lively discussion. This follow-up meeting to November’s Literature Summit aimed to discuss the next steps in setting up the international promotion of literature and books. An attendee list is below followed by the notes. Donald Smith, LAS Vice-Chair opened the meeting by thanking everyone for attending and reviewing the consensus of the International Literature Summit, held in November 2016. The final session of the Literature Summit looked at the Festivals Edinburgh model – remaining independent but with an additional aspect of collaborative development and international engagement. SDI and cultural tourism were very interested and SDI is already actively engaged. 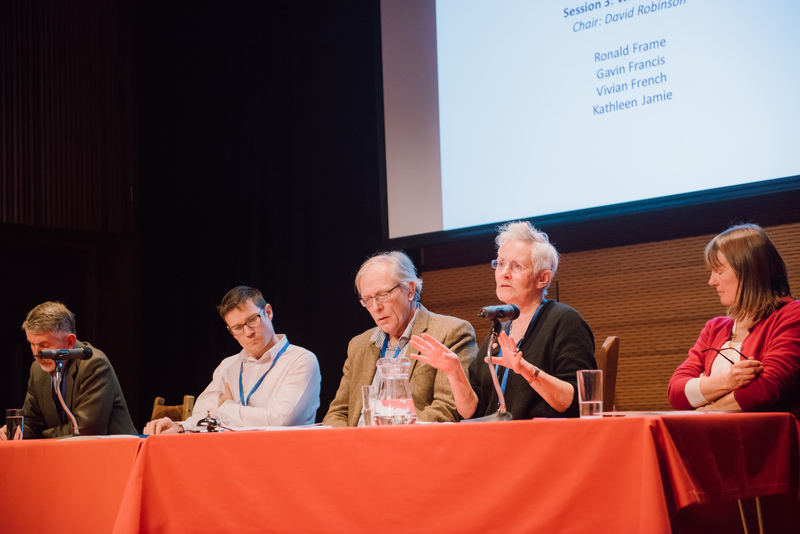 There was consensus to promote the work of Scottish-based writers and publishers on the international stage by coordinating a range of activities to a worldwide audience through a dedicated join venture / partnership front office. It was put forward that LAS is not the ultimate vehicle to achieve this, its role is to help facilitate the set up – as a midwife or parent. This collaborative vehicle structure needs to support and assist the advancement of the literature sector as a whole. What are practical next steps to advance this? It was also agreed that the meeting should focus on where we could go on this issue, not discussing what organisations currently do on the international stage. Full notes on the Literature Summit are here and meeting attendees confirmed they were happy that they were an accurate depiction of the day. Discussion was opened to the floor. Donald Smith: Is there one place that holds what’s happening in literature in Scotland? No, there is a wealth of information and an abundance of confusion. This highlights a basic information function or a gap in provision – no centralized place capturing the breadth of what’s happening in Scotland. Tom Pow: Don’t we need a name that everyone else can hang on, as there are so many disparate organisations. Organisation is one thing but centralisation is another. 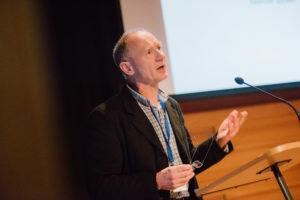 Donald Smith highlighted that the Literature Review suggested a new brand such as Scottish Literature International but there wasn’t much support from the industry and, in the economic climate, funding is an issue for a separate vehicle. Duncan Jones made the point that Scottish Literature International is already an imprint of ASLS. Marion Sinclair: Just come from a meeting on what Brexit is going to mean for culture and tourism. Key thing that emerged was Scottish cultural differentiation and how important it will be not just in the short term but also in the next 20 years. Judy Moir: Have we looked at other countries? We could come up with a model similar to those that exist already. Marion Sinclair: Wales and Ireland have models. We need a partnership approach of writers, publishers, organisations and public sector agencies, using tourism as leverage, plus the combined intelligence of the organisations. We need to be doing something new, a wider model that gets the public sector and tourism sector involved. Irish Literature Exchange is a reasonable model but doesn’t leverage public and tourism sector. Jim Tough: It’s important to factor in the feedback from the writers at the support. We need a means through which writers can see opportunities more easily. We need the bits that are outward looking and the other bits that maximise writers’ opportunities to work internationally – a mutual support mechanism. Donald Smith: Writers exchanges don’t speak to each other – so there are gaps. Ian Brown: The Literature Summit highlighted that Kathleen Jamie wasn’t aware of the ASLS using her work so the issue precedes promotion abroad, we need to open up better channels of communication within the sector. But people don’t want another bureaucracy. It would be easiest to appoint someone but no one wants that. We need to create a coordinating organisation to capitalise on variety. Should we use something that already exists and take it down a new path? Jim Tough: Could it be an extension of existing organisations such as Publishing Scotland or Edinburgh Book Festival or an extension of LAS? Extra resource would be needed given that everyone is already working at full capacity. Tom Pow: What about the Saltire Society? Jim Tough: Resource is an issue. If the option is to associate with existing organisations we need to look at how best to do it. Jenni Steele: The heritage model is a good example. We applied to universities to get funding for a research student to help coordinate collaborative opportunities, raise the game and exposure. Donald Smith: Strategic initiatives like Year of History, Heritage and Archaeology 2017 have little coordinated effort from the literature community for YHHA. 2018 is the Year of Young People. There is funding available but we don’t seem to have a way of getting together to take advantage of collaborative working. Kathryn Ross: Should Scottish Book Trust have that collaborative function? Graeme Hawley: Thought LAS was the umbrella group that knits everything together. All members should have LAS logo on their website. Jenni Steele: The Festivals Edinburgh model – the whole is greater than the sum of the parts – is a good one. It’s not an exact match as it’s an external marketing tool – but it’s something to look at. Joy Hendry: What about an amalgam of Scottish Book Trust, Publishing Scotland and Scottish Writers’ Centre – working together could form the focus. Duncan Jones: There is a danger of being too focused on arts and cultural funding and bodies. Publishing is a major industry. Books are exports – Scottish Enterprise or Department of Trade & Industry could get involved. The availability of books is issue such as the problem with Alasdair Gray’s Lanark distribution, The House With the Green Shutters being out of print, and Sunset Song has no US publisher. It needs a lot of money to help export Scottish products – millions of pounds, not thousands. Marion Sinclair: The real question is the vehicle. LAS would need dedicated staff, maybe 3-4 years in future. At this point do we have the appetite? As no one wants to see a new organisation formed and has buy in. Could we develop LAS as that mechanism? Jenny Niven: No funds for a new body. The options are LAS or a joint venture with a more powerful body to bring in the partnerships. Duncan Jones: Could we possibly have secondments to LAS to take it forward – a joint venture under LAS? Jenny Niven: Experimental approach would need clear values and goals. Marion Sinclair: We need continuity. Do we think it’s a serious activity – to start building capacity for the future. Is it an important thing for writers, publishers and the economics of it? Mario Relich: Is it something the LAS steering group could do? Donald Smith: LAS is an instrument that allows us to take the first steps. It gives a collaborative structure with purpose and status. With the potential and challenge of the task, LAS isn’t the right vehicle or the longer-term home for this. It needs a serious vehicle – not just for information, but promotion – that can bring together key and large organisations to bang heads on joint initiatives and action and engagement with public sector. We want a body that can shift things in a new world. 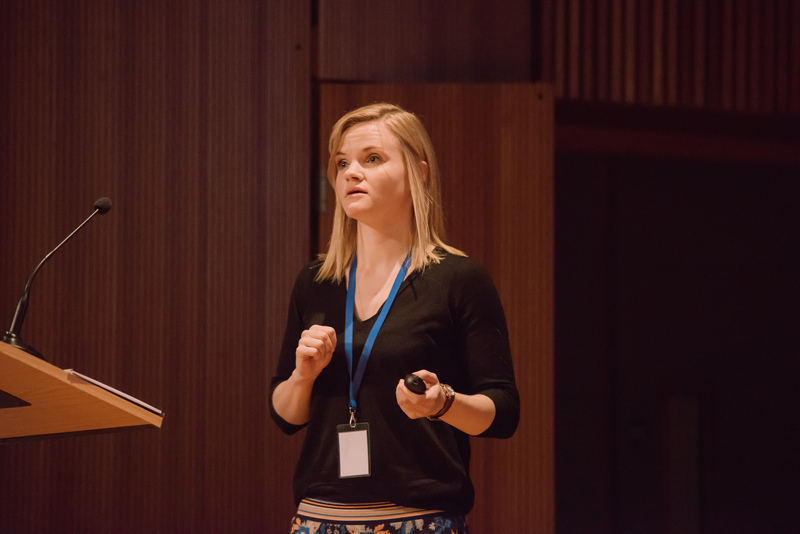 Jenny Niven: It needs to be able to talk in the metrics that other organisations use. Donald Smith: Some questions – is the focus on writers, publishers and translation, international promotion? Higher education – there is a huge international engagement with investment from literature. Is the cultural tourism aspect separate? Every area of Scotland has an important literary heritage. Is that the same business? Jenni Steele: It’s not the same purpose, but is definitely connected, for example the link with ASLS on the literature guide to Scotland. There are lots of opportunities in Scotland and the UK before international. Donald Smith: It’s a strategic information and promotion hub that could feed into VisitScotland and tourism programmes. It’s not a question of creating something that’s a mass marketing vehicle. If we set up a joint venture, we need to decide on the audience – world of tourists or festivals, libraries, literary umbrellas? Is this one instrument? Ian Brown: It starts from LAS. ASLS works in the US who are asking for books but can’t get them. How do we make individual work coordinate – information, steering, co-ordination role? There’s a gap in knowledge so people can’t take advantage of opportunities. E.g. University degrees in Scottish Literature in India. Jenny Niven: LAS need to sort the mechanism of coordinating communication – people don’t know about it. Joy Hendry: LAS could produce a monthly newsletter for organisations to feed in and share knowledge. Marion Sinclair: Do we want to do it at LAS? 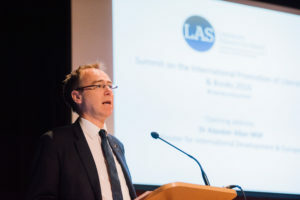 LAS performs a cradle to grave function for international promotion of Scottish literature, including export strategy, coordinating literary tourism and so on. Jenny Niven / Marion Sinclair suggested a fifth option along the lines of a new body formed with people being seconded from LAS bodies. Marion Sinclair: The Publishing Scotland part is key as books have to move, translation is important and we mustn’t lose sight of commerce and publishing matters. Donald Smith: It needs a specific vehicle of which LAS is the parent with a defined role, strategy and funding activities. Jim Tough: What does it do first? Internal audience, cultural, British Council, external international – 2/3 key things? Two-year project funded then take stock and review success & mechanism? Leadership is important – LAS as catalyst but for commerce and negotiations, leaning to Publishing Scotland, Scottish Book Trust, and Edinburgh Book Fest for right positioning as LAS is not in the correct strategic location to have that impact. Tom Pow: Domestic and international are two separate issues. Will it displace what LAS does? Donald Smith: It’s too early for LAS and this new vehicle doesn’t have the same purpose. Marion Sinclair: LAS is not the vehicle but will have oversight. LAS is a democratic body. Donald Smith: If we know what we want to achieve, what are the steps to get there? We need a clear sense of areas that need strengthening. Agree LAS to be vehicle to get this started and, if agreed, the first stage is to decide on a steering group to hammer out the four key areas. Ian Brown: Agree that LAS is the parent to oversee and see it through. Ali Rutherford: We need to go out and find the expertise to deliver the brief hammered out from steering group to solve this first. Identify first. Judy Moir: It’s really frustrating. Ireland and Wales have done international from the start. Can’t understand why we can’t just get it going. Donald Smith: The Literature Review recommended a new organisation and it was noted at end of the Literature Summit that we shouldn’t give up on it. Jenny Niven: To provide a window on Creative Scotland’s international strategy, there are distinct advantages of Scottish cultural, but it’s also sitting in a difficult financial climate. 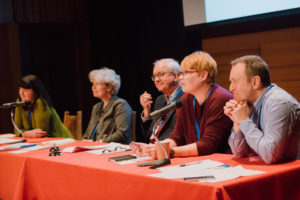 Example of a collaborative mechanism – Muriel Spark centenary – more meaningful if collective approach of organisations who are doing things to celebrate the centenary work together to change perception, such as University of Glasgow, National Library, BBC. Creative Scotland and National Library of Scotland are jointly funding a co-ordinator post that will support the work of a number of organisations. It’s an experiment as a model, which might be a possibility for the international promotion. We need to be willing to take a leap. It might be an interim option? Donald Smith: The outcome of that progress needs to demonstrate value to get more funding longer term. Tom Pow: Who is the go-to person with expertise of coordination, for example Festivals Edinburgh? Donald Smith: Festivals Edinburgh has staff of nine but it took time. Started with relevant people sinking collective funds to make collaborative impact. We need to create something for the medium to long term. We’re going through very long term adjustments. So now is the time to make a real shift, which comes back to the seriousness of the task. Marion Sinclair: We’ve agreed that we want to have a service with a working group coming up with the nuts and bolts and the priorities of the service – writers, publishers, literary organisations, public sector, tourism and industry. Jenny Niven: Also exchange and festivals, programming. Fiona Hutchison: There are parallels with the Scottish food and drink sector. Find out how they do it and see if that model would work for us. Scottish Enterprise and HIE works slightly differently so have them involved only once we know what we’re doing. Donald Smith: Scottish Enterprise’s structure is undergoing change. Gill Swales: Wanted to highlight all the promotional work from libraries & live literature sessions. There is lots of work going on through the Literature strategy in the Borders. Donald Smith: Libraries are really important. Funding is available – check with Creative Scotland and strategic partners. Donald Smith: Literature is not successful getting maximum benefit from support of enterprise network. Literature is being under exploited. Judy Moir: BOSLIT is a useful online resource from National Library to check who is published in which languages, but it’s hard to get access – be good to look at doing it again. Mario Relich: Tom Hubbard was the main instigator of BOSLIT – worth getting in touch with him about it. Asif Khan: Jackie Kay recently commissioned by VisitScotland. We need to focus on metrics – how to measure success of the work? Donald Smith: The level of cooperation between Government agencies is definitely increasing. Jenny Niven: It’s important to find the right channel, language, metric and value (intrinsic cultural value). If we don’t have the expertise already, let’s find it. Donald Smith: Higher education research is dependent on demonstrating an impact – to quantify how wonderful the literature sector is! Marion Sinclair: It’s great that we have a huge amount of consensus. We need to keep that level of ambition, not just literature talking to ourselves, start leveraging intelligence from the industry etc. The group needs to advance quickly and should be established by February 2017. LAS is set to hold a development meeting in January 2017 as part of the next steps agreed with delegates at their International Literature Summit in November 2016. The meeting will take place on Wednesday 25 January 2017 from 12-2pm at the Saltire Society in Edinburgh and welcomes individuals and organisations with a remit in the international promotion of Scotland’s literature, languages & books. 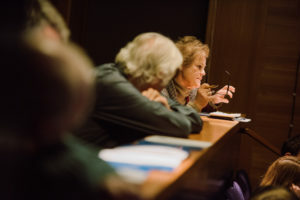 Following consensus at the International Literature Summit for a joint service between organisations for overseas promotion, the meeting aims to work out the detail with a practical, pragmatic and focused universal approach. Summary notes on the Literature Summit can be read here. We were delighted to welcome an impressive turnout of literary delegates and speakers – writers, publishers, literature organisations, literary agents, literary editors, translators and academics – to the Summit on the International Promotion of Literature & Books 2016 on 23 November for what many have described from the feedback as a stimulating discussion. We’re grateful to all the speakers, including Alasdair Allan MSP, Minister for International Development & Europe who delivered the opening address, and delegates for their contribution. Photos of the day are here. Below are the headline notes, including, at the end, the consensus reached and the agreed key action, on which we will move forward quickly, so watch this space! Are Scottish Literature and Languages part of soft diplomacy’s toolkit and if so to build what, with whom and for what purpose? How to judge success? Number of book sales or literary prize wins? What do mean, whom do we mean by Scottish writers? What does Scottish Literature look like from elsewhere? Need to balance literary identities and aspirations with practicalities and the realities of the political world. Session One – Literature Organisations’ Perspective: what needs to be done? Chair: Magnus Linklater; Panellists: Jenny Niven, Creative Scotland (JN), Cortina Butler, British Council – Literature (CB), Jeni Oliver, SDI (JO), James McVeigh, Festivals Edinburgh & Edinburgh Tourism Action Group (JMcV). JN: important to consider what success looks like. Four key themes of CS’ framework for international approach: import, export, cultural exchange, and cultural diplomacy. JMcV: Arts and tourism separated by semantics – visitors = readers, audience. Literary tourism generally packaged as heritage as easier to engage with place marketing. Challenge is how tourism sector works with contemporary writers. Engage with organisations to find the ‘hook’. JN: Cultural diplomacy and relationships are fluid. Difficult to match countries and agency objectives with artists’ creative suggestions and where they want to go. JMcV: Readers are the audience. Engage with the cultural tourism offering of all kinds of countries. CB: We need to understand and recognise the differing priorities for organisations, agencies, writers, publishers etc. to find where they overlap – the sweet spot. JO: Need to understand what starts the conversation with a country, which varies from country to country. Need to start thinking about its audiences, tourists, readers – where do we want to engage? Don’t rely on what is already out there and the known writers. Need to do more about content that resonates here – different across Scotland. Businesses here are identifying new ideas, taking on the risk and offering support with that risk. CB: English and Scottish book activity looks for a range of writers from across the country, depending on what the project is looking for. JO: What is your audience, where are they and what is the hook? How to bring it all together? JN: An atmosphere where organisations are championing each other’s efforts. Need for a collective mechanism to bring these efforts together. New agency not feasible, but tangible efforts can be made. Persuade Scottish media to focus on the arts more. Work in development visibility on increasing Scottish arts in the media. Session 3: Writers’ Panel – what additional support do writers need? Chair: David Robinson; Panellists: Ronald Frame (RF); Gavin Francis (GF), Vivian French (VF) and Kathleen Jamie (KJ). VF: When do you decide that an author is Scottish and that their work is Scottish? Children’s picture books are a massive export. 80% of books in a Copenhagen bookstore originated from the UK. Live aspect is very important for children’s books. GF: Attending events or travelling has been under different provisos, different organisations and mechanisms. It’s very precarious, often fortuitous. It would be useful for authors if they knew that British Council would help fly them if there was a bursary or more information available. RF: Scottish fiction doesn’t seem to sell well. It sells well in the US but less so here. KJ: Scotland is a country of landscape, not of crime. VF: With the children’s book world, it’s our books going out but not many books coming in. GF: There are hopeful signs with basic minimums to pay writers travelling to events. Most writers have a couple of jobs to support themselves too. Jenny Niven mentioned Open Project Funding less than £5k – smaller pots of money available with quicker turnaround. Key issues: writers and bureaucracy for applications and rights issues, points raised about the issue of selection of writers, perception that the same writers get chosen for agency projects, writers not being aware of how their work is used or what organisations offer. Also highlighted was International Literature Showcase in Norwich, which CS is partner funding. Session 4: Publishers’ Panel – what more could be done internationally? 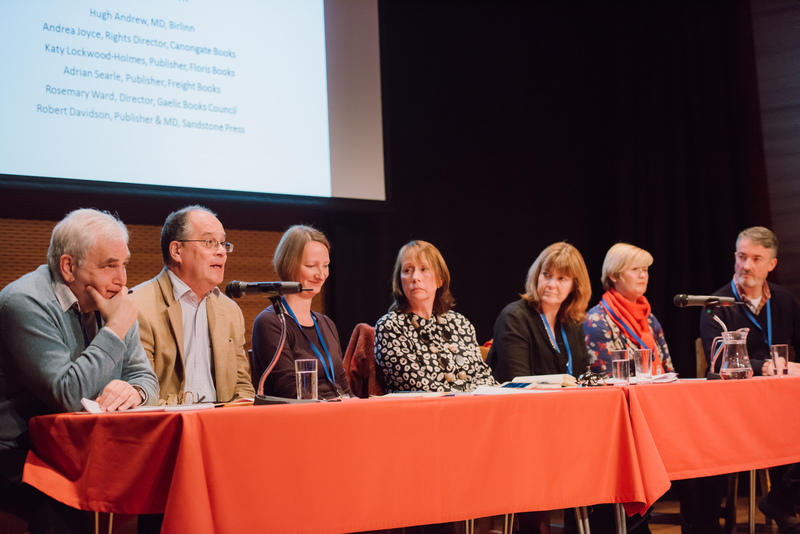 Chair: Jenny Brown; Panellists: Hugh Andrew, Birlinn (HA); Andrea Joyce, Canongate Books (AJ); Katy Lockwood-Holmes, Floris Books (KL-H); Adrian Searle, Freight Books (AS); Rosemary Ward, Gaelic Books Council (RW), Robert Davidson, Sandstone Press (RD). AS: Sell more books to International publishers, more resource to Publishing Scotland to expand on success. Foundation of success based on books that have done well in their own country – over 10,000 copies. Build the market in Scotland. Pressure the media for support. KL-H: Children’s part of Scottish Literature is building readers of the future. Authors & illustrators’ success overseas translates in sales and rights sales. RD: Action on sales – we have a team in North America selling Scottish books. Face to face contact is key. AJ: AJ: Key for Scottish publishers to get out and build relationships with international publishers to persuade them to take risk on a new voice and new writer. Need Go See follow up fund, Reverse Fellowship internship. RW: Co-ordinated initiative to promote writers and authors. HW: Home market is dysfunctional. If we don’t make any money at home, can’t expand and invest in foreign markets. Need self-sustaining home market. Cortina Butler, British Council – on looking at other countries – recommended Polish Book Institute as a good example of online resource providing support and information available to writers. Translation needs with marketing component. AS: Good examples is NORLA, great engagement, success in home market but doing it for 25 years – long term investment. Why does Irish diaspora support their books more? How might this be expressed and developed? Joined up thinking – can different bodies and organisations release boundaries in guarding own patch to work in coordination? Festivals Edinburgh suggested as a possible comparator. Further support for Go See Fund for follow-up visits to new markets, showcasing a new product to a new market or looking to build new relationships. Donald Smith: Mission critical that Creative Scotland support those who already exist so it’s difficult to find new resources for a new organisation. Jenny Niven: Some seed money is available from Creative Scotland to move things forward. Joy Hendry: Literary editors and magazines not discussed. No recognition for literary editors’ unique links and relationships on international stage with writer networks. Need formal recognition and input from literary magazines. Ian Brown: Problem of not overlapping – clear need for more coordinating and communicating within the sector. Fiona Brownlee: Very positive day. Publishing Scotland and EIBF bring a great deal and should be involved. James Robertson: Opportunity to promote literature in collaboration with other cultural forms – overlap with music and other art forms, especially film. Ron Butlin: Need to help Scottish Government understand that the arts are cost-effective PR for Scotland. 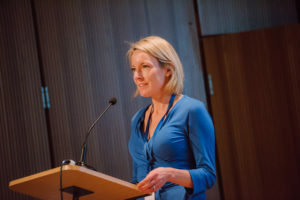 Kaite Welsh: Soon to be four literature officers at Creative Scotland – please contact us to ask questions. Linda Strachan: Authors don’t know what’s going on and how their work is being used. How to communicate information to the grassroots level? It needs to reach the writers and the creative people. Robyn Marsack: Poets needs to try and subscribe to literature organisations such as SPL. Writers need to make an effort too – it’s a two-way system. Graeme Hawley: Scottish Literature on Wikipedia needs updating. Far less info, photos, links available than Irish Literature – missed opportunity, can be updated by anyone! 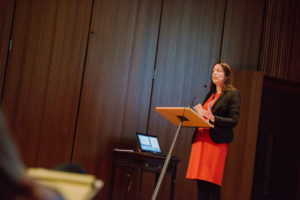 Cathy Agnew: Highlighted DG Unlimited – new online membership organisation for those who care about Dumfries & Galloway’s creative sector and cultural life. Shared press & publicity. A meeting will be convened, under the auspices of LAS, via an open call, that both members and interested non-members can attend to discuss and work out the detail of the Summit’s consensus for a joint service between organisations with a practical, pragmatic and focused universal approach. Timescale: by end February 2017. Jenny Niven, Head of Literature, Languages and Publishing at Creative Scotland today, Wednesday 23 November 2016, provides an update on Creative Scotland’s work to support Scotland’s Literature and Publishing Sector, since the publication of its Literature and Publishing Review. 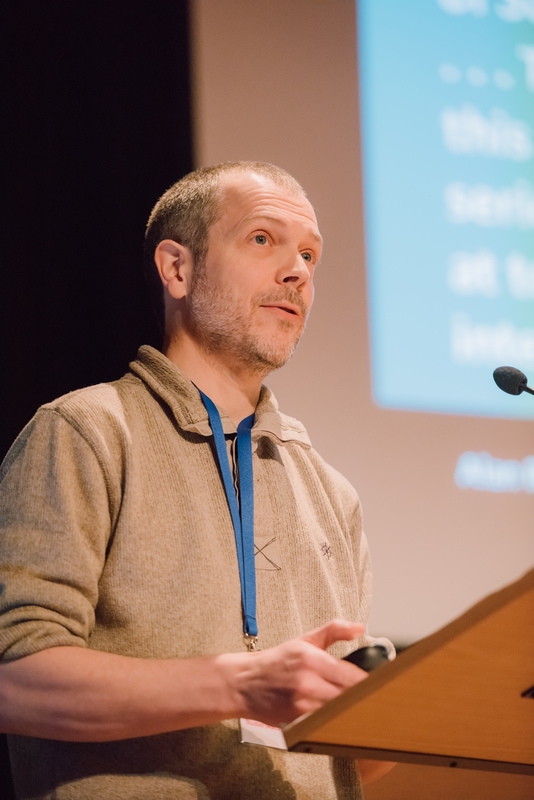 The update coincides with Niven’s appearance at Literature Alliance Scotland’s International Summit, taking place at Edinburgh’s Storytelling Centre, during Book Week Scotland. “Convened in direct response to recommendations within the Literature and Publishing Sector Review published in June 2015, the Summit is bringing together – for the first time – writers, publishers, literature organisations and public bodies to plan how Scotland can better support the international promotion and presentation of Scotland’s writers and literature. “A range of other projects, including new support for translation as well as investment in the recently established International Literature Showcase are part of our increased focus on international working, in response to feedback from the Literature sector in 2015’s sector review. Published 18 months ago, the Literature Sector Review produced a broad spread of recommendations aimed at improving the health of literature in Scotland, sustaining the sector as a vibrant form of cultural expression, and as an important creative industry. The review covered a range of areas including individual writers, the publishing industry, developing readers, and the international promotion and development of Scottish writing. Today’s International Summit has been co-ordinated by LAS, in direct response to a specific recommendation from Creative Scotland’s Literature and Publishing Sector Review, to explore a more strategic approach to the international promotion of Scottish writing and literature. Dr. Alasdair Allan MSP, Scotland’s Minister for International Development and Europe, will open the event. The aim of the day is to lay the groundwork for a stronger international presence for Scottish literature. Creative Scotland is partner funding a major new initiative with Writers Centre Norwichand the British Council to promote UK writers and literature organisations overseas. Launched in September 2016, the online International Literature Showcase is supporting talented upcoming writers with promotional opportunities, new commissions and the development of their international profile. In the last financial year, 2015-16, Creative Scotland awarded more than £4million to writers, poets, book festivals, storytellers, publishers and literary organisations to support their work in Scotland and internationally. For further information on Creative Scotland’s support for Literature, languages and publishing please visit, here. Creative Scotland’s Open Project Fundoffers support for individual writers at all stages of their careers. Awards made this year include Janice Galloway, Kirsty Logan, Amy Liptrot, Ewan Morrison, Merryn Glover, Malachy Tallack and Gordon Meade. 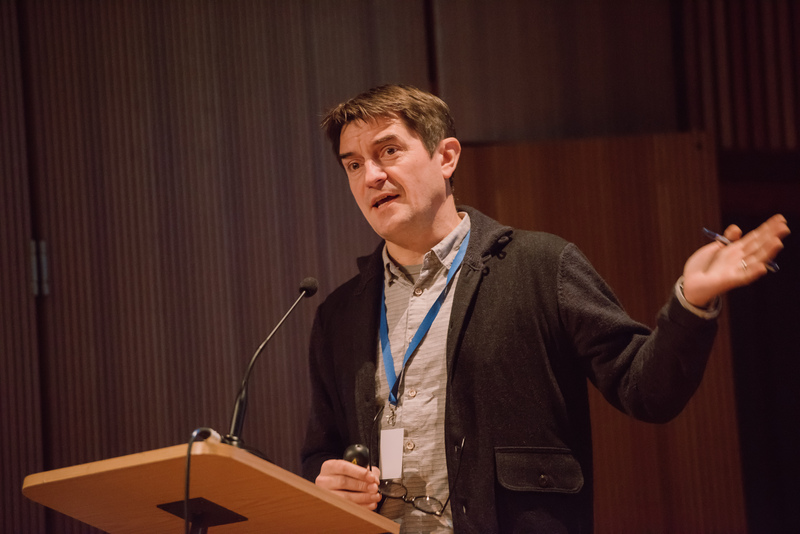 Creative Scotland has partnered with the Scottish Review of Books to run the Emerging Critics Mentoring Programme, which was launched with a talk at the Edinburgh International Book Festival in August 2016. Between November 2016 and February, 2017, 20 writers looking to break into literary criticism are being mentored in small groups by critics Alan Taylor, Rosemary Goring, David Robinson, Kaite Welsh and Dave Coates. Mentees are receiving guidance on writing literary criticism for print and online platforms and are receiving individual feedback with a view to showcasing their work on a special Emerging Critics section of the Scottish Review of Books website. Launched in August 2015, the new Translation Fund, delivered by Publishing Scotland, is designed to encourage international publishers to translate works by Scottish writers. The £25,000 fund has already supported the translation of work from authors such as Amy Liptrot, Gavin Francis, Jenni Fagan and Jackie Kay translated into a variety of languages including Spanish, Italian and German amongst others. The Fellowship Programme launched in August 2015 with the aim of forging stronger and more strategic links between international and Scottish publishers and agents to discover and acquire the rights to Scottish books. Developed in partnership between Creative Scotland, Emergents and Publishing Scotland, the programme has engagedeighteen international publishing fellows. The newly established Translation Residency Programme is offering writers the opportunity to take the time to work on the translation of Scottish works. Delivered by Cove Park in partnership withPublishing Scotland and the British Centre for Literary Translation. Anne Brauner (Germany) and Clara Pezzuto (Italy) undertook residencies in September 2016 and translated works byScotland based authors – The Nowhere Emporium by Ross Mackenzie and And The Land Lay Still by James Robertson, respectively. In 2017, the Translation Programme will expand to include partnerships with Writers Centre Norwich and University of Glasgow, in addition to a continuing relationship with Publishing Scotland, creating a UK-wide and outward looking programme. Highlights include residential mentoring for translators and poet-poet translation, as well as an increase in the number of translation residencies available. Literature Alliance Scotland was awarded £50,000 in April 2016 to undertake a two-year programme of advocacy and networking involving its 26 member organisations (e.g. EIBF, Scottish Poetry Library, Scottish Book Trust, Saltire Society). The programme of activity will be rolled out over the next 18 months and the first output is today’s international summit. Creative Scotland’s recently published Arts Strategy underlines its ambition to improve the financial context in which artists and other creative professionals develop and make their work. The Strategy has been informed by findings reported in the Literature Sector Review which found that that 81% of Scottish writers who responded to the survey earn below the National Minimum Wage. 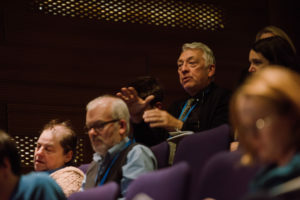 Together with the Society of Authors in Scotland, and other partners, Creative Scotland is exploring ways to address this issue and encourage organisations representing writers to continue to work closely with the sector in setting standards and terms of engagements for activities such as travel, speaking engagements, residencies, and publishing contracts. 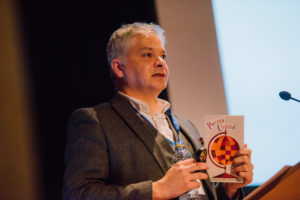 In August 2015, Creative Scotland and the National Libraries of Scotland announced the first Scots Scriever – poet, novelist and playwright, Hamish MacDonald. Responsible for working with the cultural sector, communities, and in particular, schools across Scotland, the Scriever will work to enhance awareness, understanding and use of Scots. The Scriever post is also directly complementing Education Scotland’s work through their Scots language co-ordinators to broaden engagement of the Scots language policy. 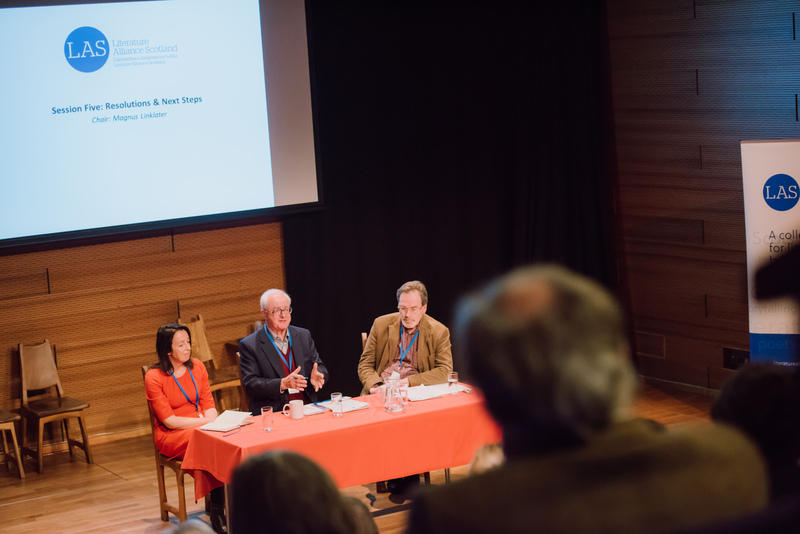 A Summit to debate how Scotland’s literature sector should promote its writing and writers overseas is set to take place on Wednesday 23 November 2016 at the Storytelling Centre in Edinburgh. Taking place during Book Week Scotland, the Summit is hosted by Literature Alliance Scotland (LAS), Scotland’s largest network of literature and languages organisations. Dr. Alasdair Allan MSP, Scotland’s Minister for International Development and Europe, will open the event that brings together – for the first time – writers, publishers, literature organisations and the main public agencies in Scotland with a responsibility for the international promotion of Scotland’s literature and languages. Author and publisher James Robertson will deliver a keynote speech. Speakers also include non-fiction award-winning writer Dr. Gavin Francis, poet Kathleen Jamie and children’s author Vivian French, publishers Canongate and Birlinn, literature organisations Publishing Scotland, Edinburgh International Book Festival and Association of Scottish Literary Studies, and public bodies and agencies Creative Scotland, British Council and Scottish Development International. The full programme is here. Minister for International Development and Europe, Dr Allan said: “The Scottish Government is committed to supporting Scotland’s literature internationally. 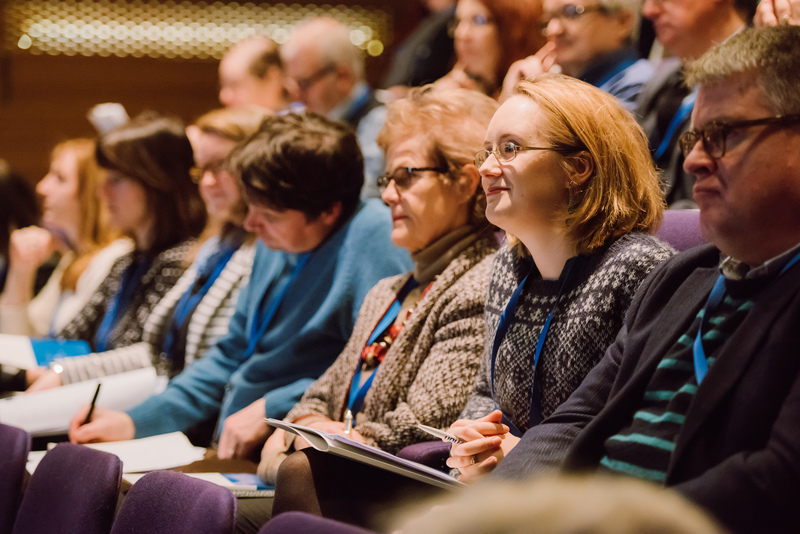 This event will bring together for the first time public agencies, writers and literary organisations to discuss ways to strengthen the presence of Scotland’s literature and publishing on the international stage. Donald Smith, Vice-Chair of LAS said: “The issue of Scotland’s international presence has been discussed a great deal over the years. This Summit marks the first time that the key players will be together in the same space with the same goal of agreeing what needs to be done and how we might work together to do it. Published in July 2015, Creative Scotland’s Literature Sector Review provides an overview of contemporary literature provision, reflecting the successes and the distinct qualities of Literature and Publishing in Scotland whilst at the same time identifying development needs, future challenges and opportunities, which will help inform the future work to best support literature and publishing in Scotland. 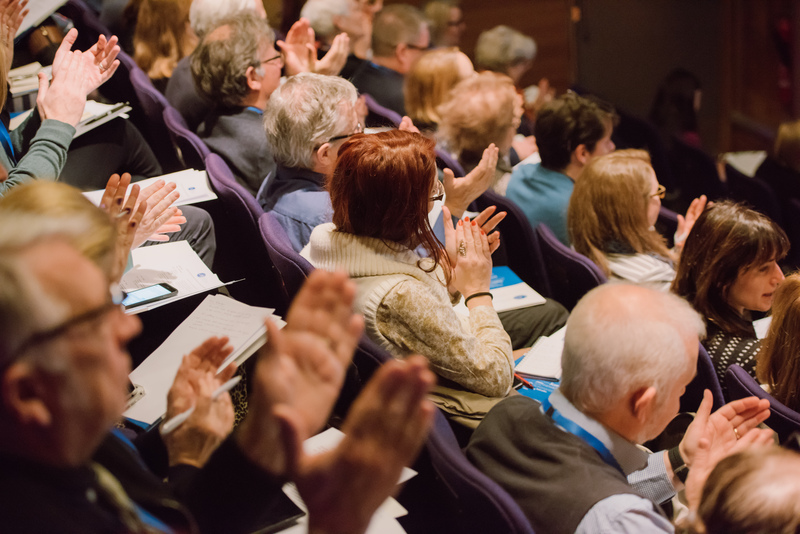 The Review produced a broad spread of recommendations aimed at improving the health of literature in Scotland and sustaining the sector as a vibrant and resonant form of cultural expression, and as an important creative industry. It covers a range of areas including writers, the publishing industry, developing readers, the sector ecology and the international promotion and development of Scottish writing. Literature Alliance Scotland, a membership organisation, represents the principal literature and languages organisations in Scotland, and is committed to advancing their interests at home and abroad. We exist to provide a strong, trusted collective voice on their behalf. 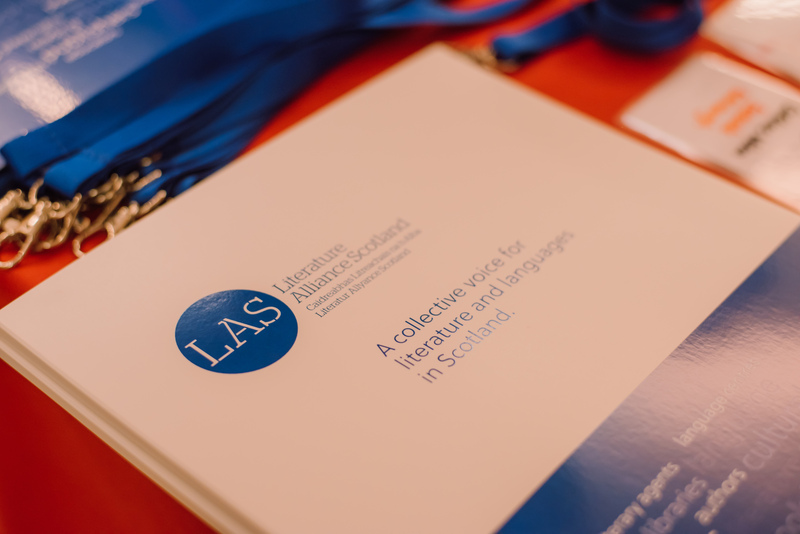 Formed in Spring 2015, LAS is a successor to the Literature Forum for Scotland. Working with a range of partners, it is delivered by Scottish Book Trust, a national charity changing lives through reading and writing. Scottish Book Trust believes that books and reading have the power to change lives. As a national charity, we inspire and support the people of Scotland to read and write for pleasure. For more information about Book Week Scotland, visit www.bookweekscotland.com. Follow @Bookweekscot on Twitter, check out #bookweekscot or like the Book Week Scotland Facebook page.